A few times in my trading life something came along that was a game changer for me - something that increased my profitability by a significant amount. Another one has come along. I don't want to sound too optimistic but I do want to share when good things are discovered. I'm not a great inventor but I am good at finding great uses for something someone else has invented. I am good at seeing the possibilities. Market Profile is a great example. The latest one is what I call Order Flow Trade Bars or called Volume Imbalance by the folks over at MarketDelta. In the last few years I had been looking for something that gave me more than the old Footprint or Volume Breakdown charts could deliver. I wanted what I had on the floor as a Local. I wanted to see what was trading at the bid price and what was trading at the offer price just as I did in the pit, and I needed that visually so I could react quickly to unambiguous information. Was it "SOLD" or "TAKE 'EM". The Order Flow Trade bars give me that information in real time. I can see when there is significant activity that should impact price direction. These bars are just simple OHLC bars with the notation of the number of contracts traded at the BID and the number traded at the ASK and with colorization to show significant Order Flow Trades. My usual EL trading pictures have not changed at all. It's just that I now have an added filter for both entries and exits. I can get in one bar earlier and bail if Order Flow does not confirm thereby getting a better trade location with very low risk. A trade is made up of the trading picture and the context. The WHEN and the WHERE. The picture below shows the Order Flow Trade bars (OFT). The RED shows significant trading at the BID and the GREEN shows significant trading at the ASK. This is MultiCharts and the OFT bars were coded by my programmer. 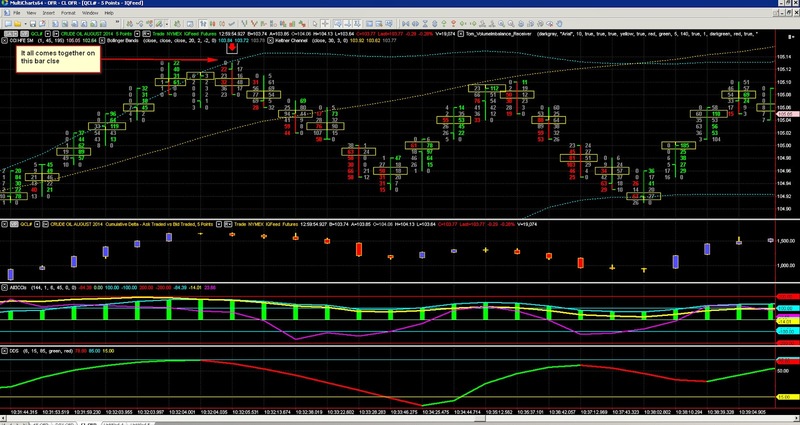 When NinjaTrader 8 is released I will also have a NinjaTrader version. NT7 doesn't have the technology to produce OFT bars historically. The Order Flow information has added significance at support and resistance areas and after pullbacks. I will be showing a lot more of these OFT bars in future posts. Also, this information will be included in my Market Profile book which will need a significant amount of extra information added as the power of the Market Profile together with OFT is quite incredible. Hi EL, I am a long time student of yours. Are you planning on adding OFT Bars into FLO BOT ? Good to hear from you John. The OFT bars are too discretionary so far. Its a matter of" I know it when I see it" at the moment. Too many combinations. how soon until your book is completed? Looking forward to reading it! Hi EL, how is this different from MarketDeltas Volume Imbalance Footprint chart? As I say in the post, MarketDelta call it Volume Imbalance. The rules for the colorizatioon are changable from chart to chart and market to market. MarketDelta have done a great job with Volume Imbalance. Have a look at the next post where I have the latest version of the OFT bars with a more informative display. Hi Peter, the so called orderbook is a dynamic work of fiction. It's full of place holders and spoof bids and offers. It also does NOT show the STOP orders which become a considerable part of the volume traded. The algos multiply the effect of this. Then you have submarine or iceburg orders coming in. All in all, it's what trades that matters. Hey EL. Congrats to you and your daughter for embarking on this journey! I really like your blog. I also like the OFT bars you have on your screen. Of all the OFT versions I have seen out there, I like yours best. Are you willing to share the code? Perhaps for a price? If not, may I be put into contact with your programmer? I would like to have your exact OFT Bars and your exact "Cumulative Delta, Ask Traded VS Bid Traded" for my trading. I'd really appreciate your help, thanks!